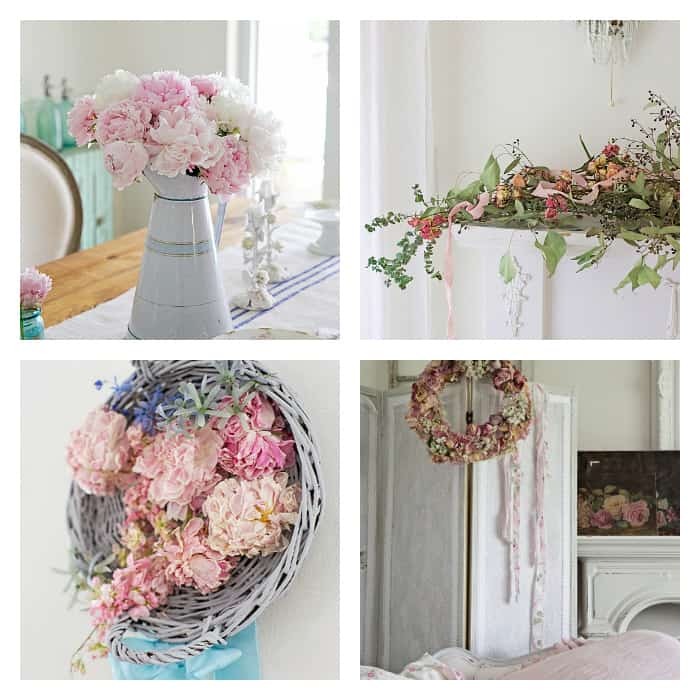 French farmhouse flowers and how to display them. Summer is ever abundant with a choice of fresh flowers in many gardens throughout the world, and in our markets and flower shops as well. The time is right to buy flowers anytime for me, and when I do my weekly errands I always make it a point to pick some up at my local florist. Now is the time though to fill up baskets and to dry them for future use and display and today I’m sharing some of my favorite ways to show them off around your home. Not only do I enjoy displaying flowers in baskets or crates, but I’ve found this an easy way to dry them too. I’m a serial crate collector and in this vintage blueberry crate I made a pretty liner and just started gently placing summer flowers inside to dry. Keep the crate out of direct light and in a cool place like a closet if possible. They will keep their color better if kept out of the light and should dry in a few weeks. 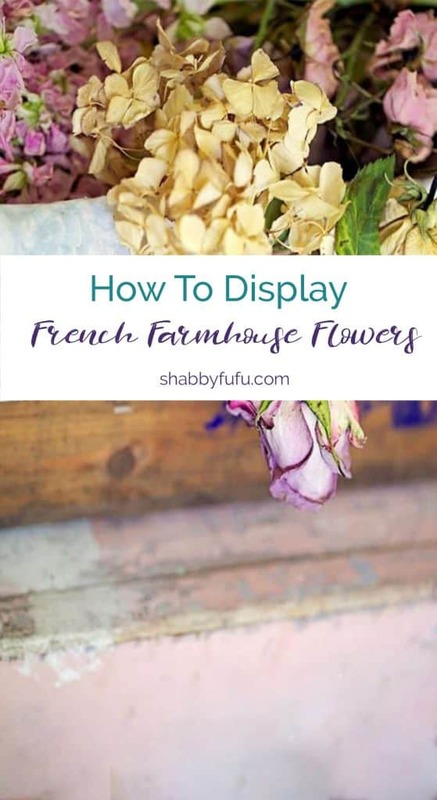 In displaying French farmhouse flowers, you would then pull them out and arrange carefully and they should last for several years. 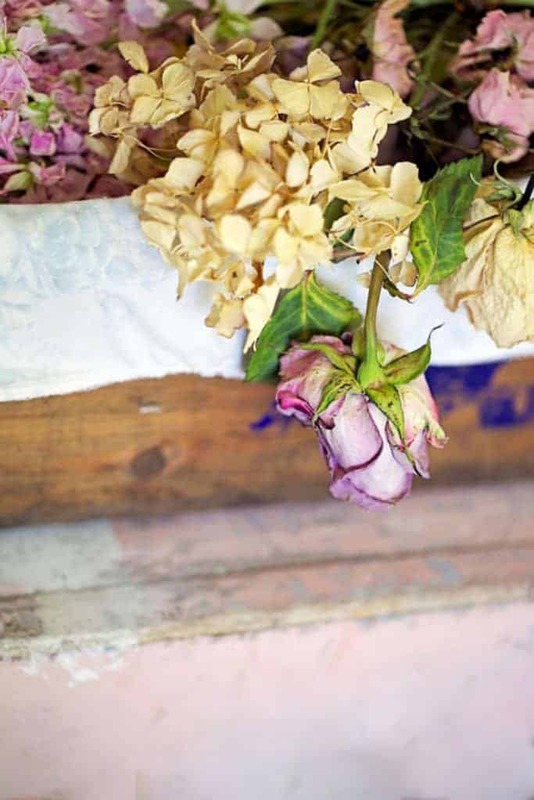 If you have roses to dry, try snipping them just below the head and placing them into a bowl face up or stick the shortened stem into a piece of floral foam. Keep in the dark until dry. 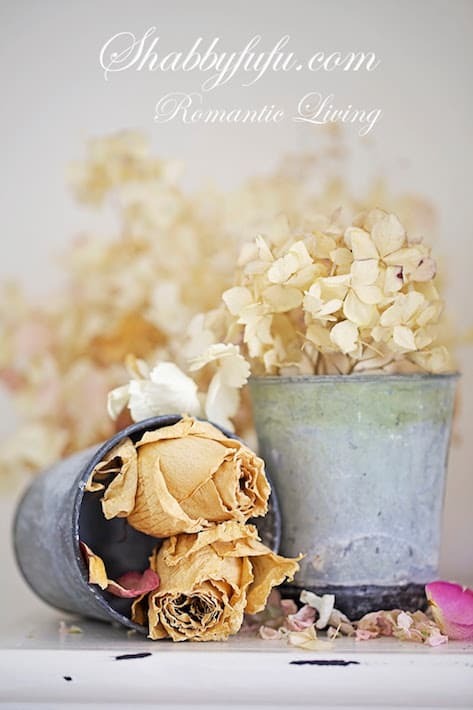 I have some vintage French zinc seed pots from a trip to France and I bring them out to create artful vignettes with my dried preserved flowers and petals. This would be great for a FRENCH FARMHOUSE DECOR feel, and you can mimic the seed pots with some INEXPENSIVE TIN POTS. Truth be told I’m not much of a yellow person, but these sunflowers look so pretty when dried! Again I think that they have a FRENCH FARMHOUSE look and the beat up old flea market trophy adds to the RUSTIC feel. I don’t believe in striving for perfection in creating a DRIED FLORAL BOUQUET, only a nice mix of like minded colors and flow. 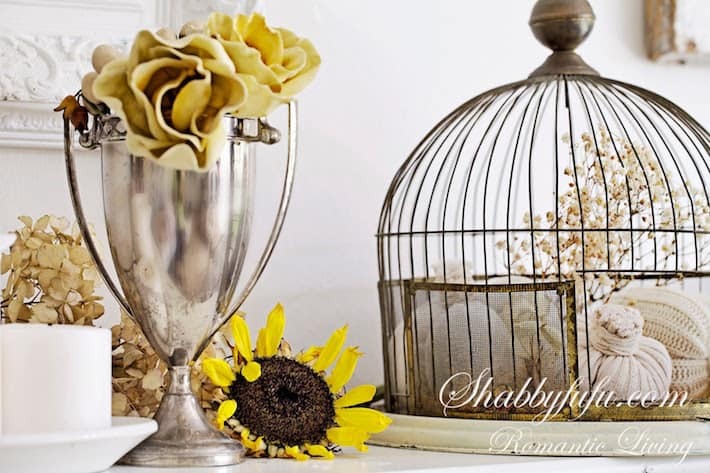 Vintage birdcages are perfect for mixing into displays and on the mantel I’ve displayed this rusty wire birdcage with some dried raffia and flower petals and tied a piece of lace to the top. 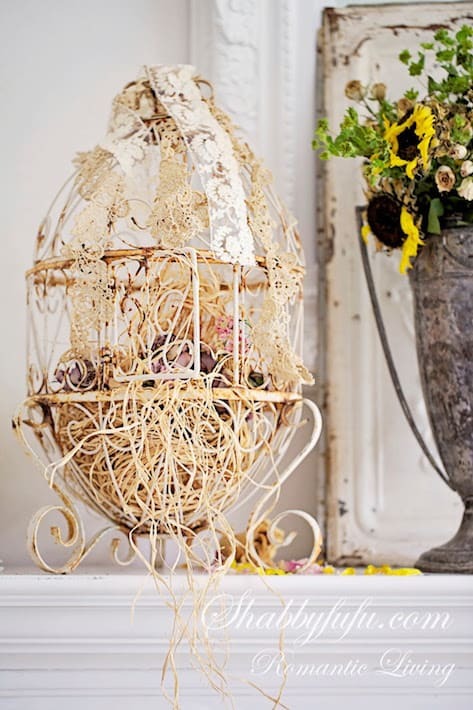 A VINTAGE BIRDCAGE with some SWEATER PUMPKINS inside for fall harvest. Always step back and look at your arrangements and create some movement and a flow of color. 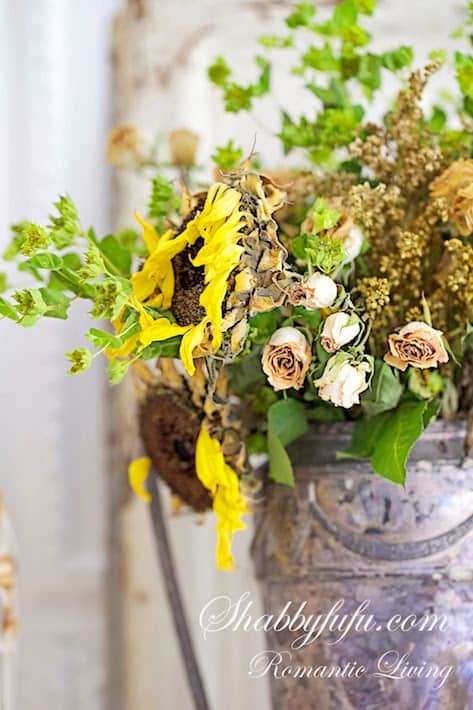 I love to mix tattered with elegant, beautiful with rustic and shabby with chic (as in: SHABBYFUFU) so tarnished metal seems to be a natural with dried floral arrangements. 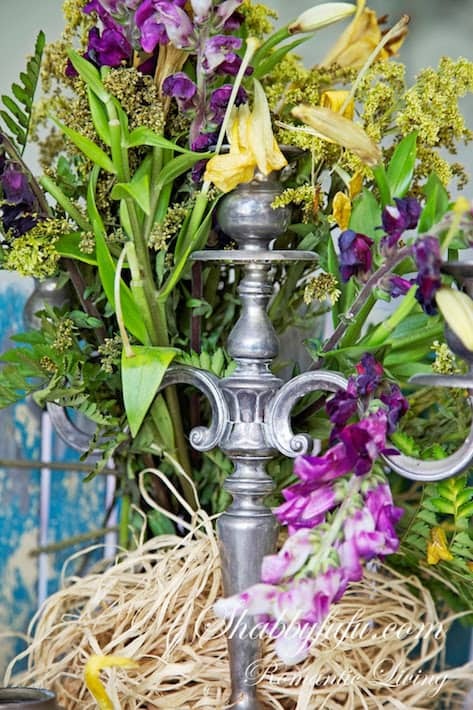 An old candlestick with a crown of some dried flowers. I seem to have pretty good success with drying flowers…except for hydrangeas. I’m not sure why, but it could possibly be that they don’t grow here and I’m forced to buy them at the florist. Maybe you have a good method, so if you do please tell me! I have actually gone the route of dried hydrangeas for sale for fall display and they are not generally more expensive than buying fresh! 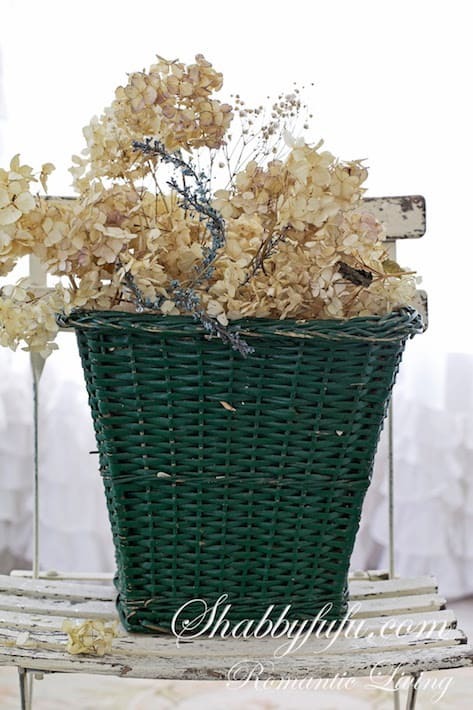 Baskets like this vintage wicker basket are perfect for display. 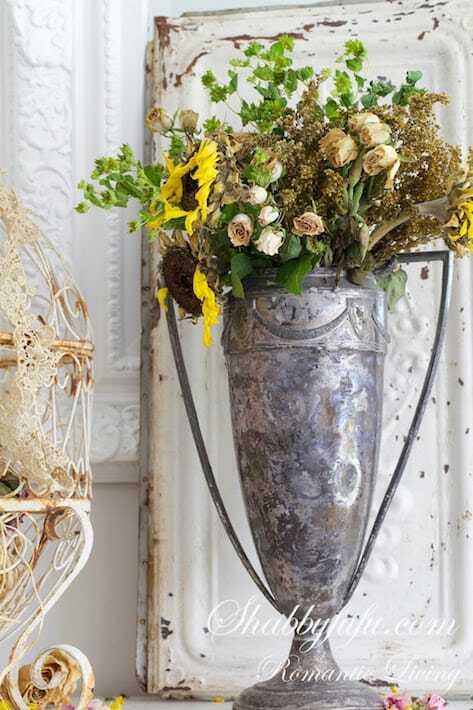 Tarnished silver and dried flowers are such a great mix of FRENCH FARMHOUSE and SHABBY CHIC. 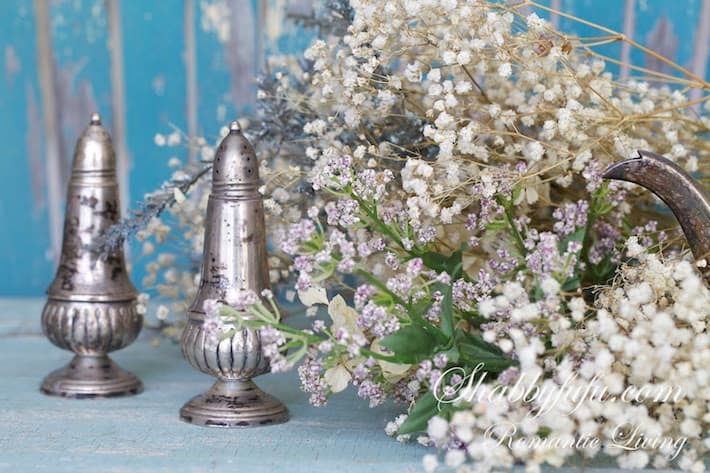 Just a simple pair of 50 cent thrift store silver plate salt and pepper shakers with some dried baby’s breath and other small florals. 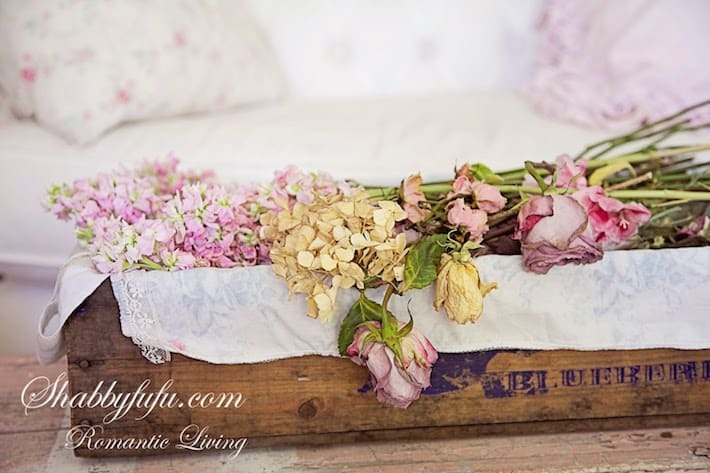 I’m also a fan of silk flowers and I DO use them in my home, as today they look so real! 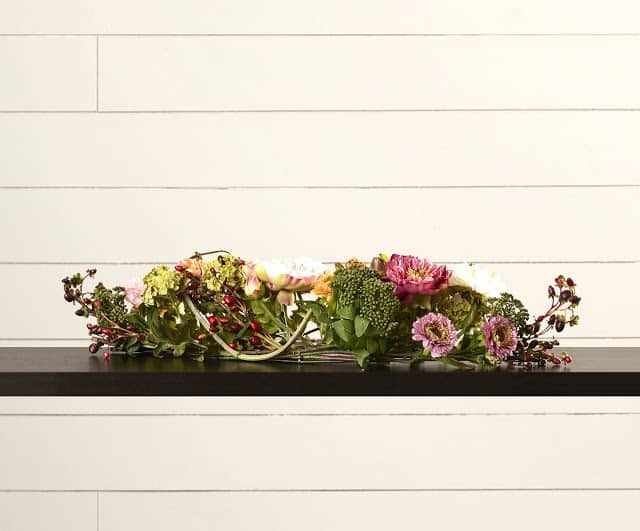 A favorite arrangement that I found while shopping around on-line (affiliate). I would definitely use THIS ONE across my dining table, so I wanted to share it if you are looking for something:-). 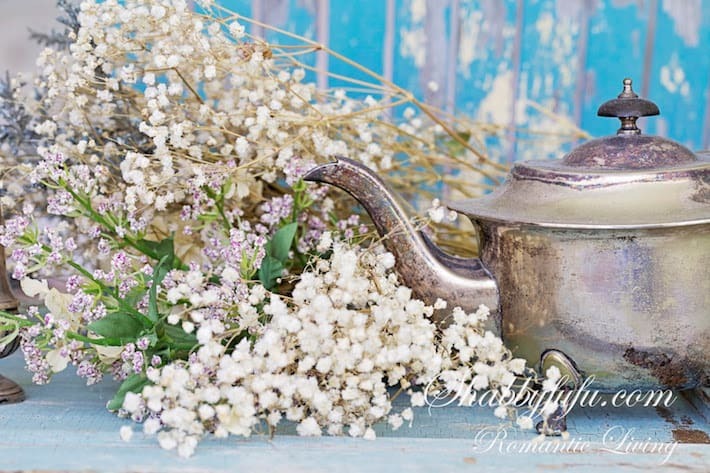 If you enjoyed my dried floral arrangements today, you might enjoy these posts that are directly linked below! Thank you Norma for stopping by and I hope that you have a good weekend! Hi Cindy! I was given the sweater pumpkins by a friend and it is yet another fun idea. Happy weekend! Beautiful post. I’ve been drying my zinnias and loving the way they are turning out. Thank you for all your tips. Thanks for stopping by and happy creating with your zinnias! Love all your posts! Started following you in the pages of ROMANTIC COUNTRY HOMES. I brought some flowers home from a bouquet at work several weeks ago (I believe they are hydrangeas). I left them in the plastic bag I brought them home in, and just hung the bag on my hall tree. I just took them out of the bag to check on them, perfectly dried, a soft lovely tea stained color! So very excited with how they turned out! Thanks again for your lovely posts.